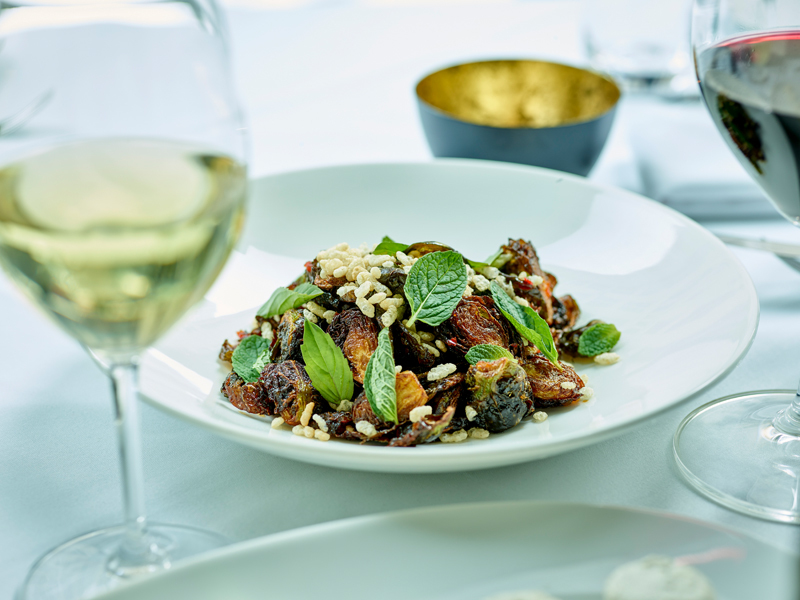 CRISPY BRUSSELS SPROUTS, SWEET CHILI, PUFFED RICE, KAFFIR LIME, THAI BASIL, AND MINT. Asked about Object Orange, a dessert at downtown Detroit’s Besa, our waitress masterfully transitioned from server to storyteller. Rather than the star ingredients — orange and annatto custard and brown butter ice cream — the protagonists were local painters. She spoke of the artists’ mission to correct the city’s blight issue by painting dilapidated homes a can’t-miss shade of bright orange to encourage city workers to demolish homes tarnishing Detroit’s landscape. Hence, Object Orange. 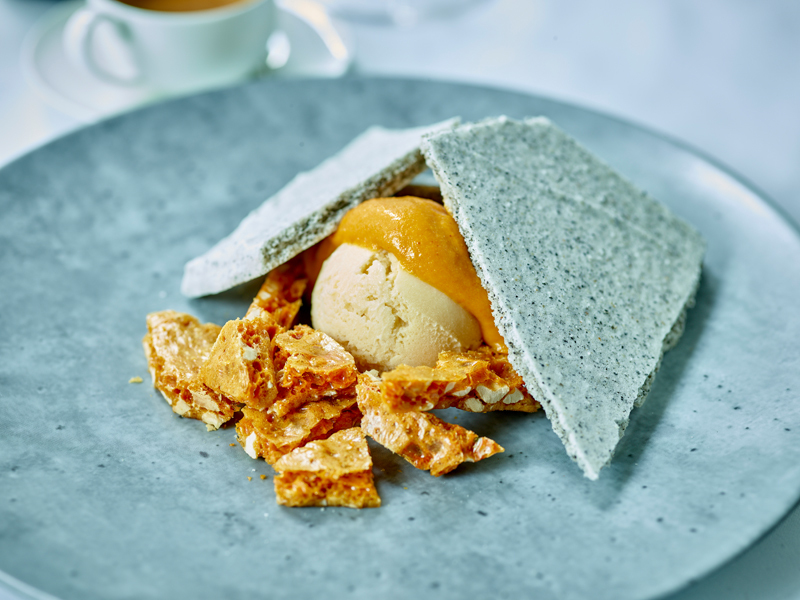 Named after the art project of the same title, the dessert, equally sweet and tart, is served atop peanut brittle with shards of sesame meringue toppled on top to represent the concept of crumbling edifices. 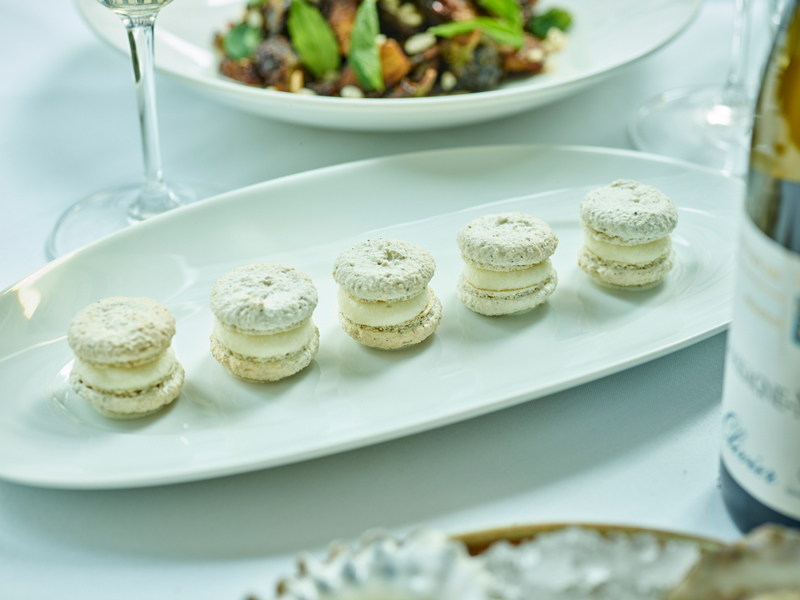 CACIO E PEPE MACARONS: THE SWEET-SAVORY STARTER REIMAGINES A CLASSIC PASTA DISH. Much, if not the entirety of the menu at Besa consists of imaginative interpretations of stories, ideas, and experiences; each dish a testament to Schutte’s artistic background. Art is Schutte’s driving force and the vessel that ushered him into the culinary world. “In high school, I would paint and make videos — it didn’t matter what it was. Even if I was scribbling, there was just always something coming out of my fingertips.” Then, he went on to study psychology in college. “For the first time, I sank myself into my academics and at one point I woke up and said, ‘I feel empty.’ ” A “spur-of-the-moment” trip to Maui inspired Schutte to take his creativity to the kitchen when a bite into a homemade ice cream sandwich opened Schutte’s eyes to the possibilities of food. With roles at the award-winning Tuscarora Mill in Virginia, Atlanta’s One Midtown Kitchen, and his own Revision in L.A., and as winner of the Food Network’s Cutthroat Kitchen, over time, Schutte has earned a reputation as an innovative chef. He’s braised onions with tequila, infused ricotta with smoky tobacco, and puffed a chicharrón churro. OBJECT ORANGE: AN ORANGE AND ANNATTO CUSTARD OFFERS A BRIGHT HUE INSPIRED BY DETROIT’S INFAMOUS ART PROJECT. At Besa, he reimagines Cacio e Pepe in the form of macarons. Silky parmesan cream is sandwiched between black pepper cookies whose heat is quelled by the sweetness of the French pastry. Sea scallops rest on a bed of sweet masa polenta studded with braised bacon and are drizzled with a red chili-white chocolate sauce. And the “Vichyssoise” is a mere interpretation of the traditional. Like a splash of paint, a smattering of potato and leek broth decorates the plate, while a warm potato waffle takes center stage dressed in a dollop of leek butter. 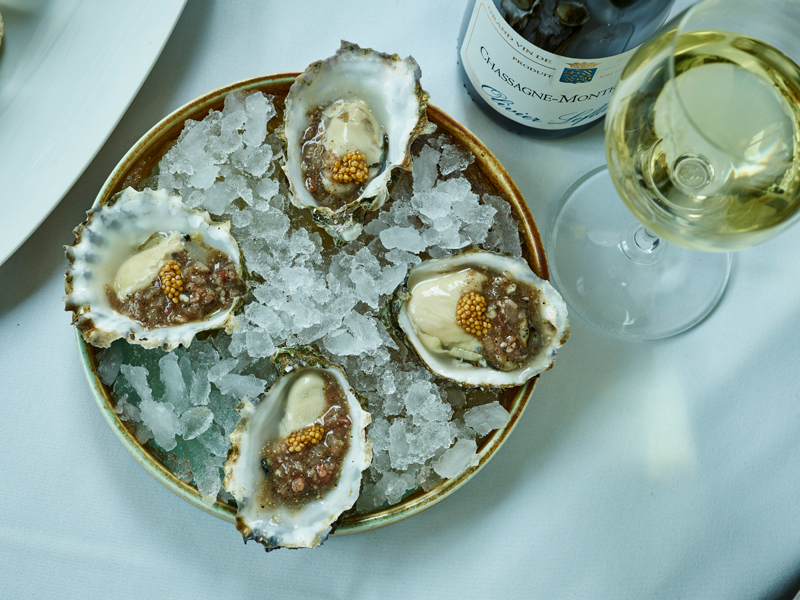 AT THE RAW BAR, OYSTERS ARE TOPPED WITH PICKLED MUSTARD SEED AND BACON MIGNONETTE. Begaj and Schutte have that grind and business sav in common. Begaj, born and raised in Albania, cut his teeth as a server’s assistant at Talulah and quickly climbed the ranks. “I wanted to do the work and I wanted to be the best at it,” he says. Begaj’s role is his first position in leadership at a restaurant. Street art projects … are part of what piqued Executive Chef Kyle Schutte’s interest in uprooting his life in Los Angeles, to relocate to Detroit. If the dishes at Besa are micro masterpieces, then the restaurant’s interior is a contemporary museum of art. Housed in the historic Vinton Building, designed by famed Detroit architect Albert Kahn in the mid-1900s, the restaurant was designed by Neumann/Smith Architecture. The architects and interior designers at the design firm whose offices are based in both Southfield and Detroit, worked diligently to strike the balance between an old and New-World feel. The space is encapsulated by floor-to-ceiling glass windows, which look out to a bustling Woodward Avenue. Contemporary and geometric light fixtures hang, casting warm reflections on white marble counter tops and glossy metallic details. 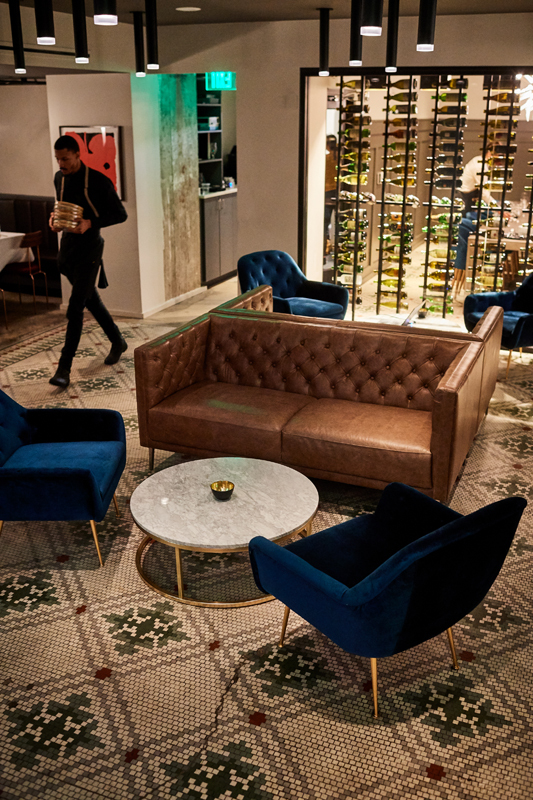 In an underground lounge area, Besa nods to the building’s history, maintaining original tile flooring and embracing its imperfections. The dimly lit space complete with tufted leather couches and velvet chairs, is an ideal setting for a more intimate dinner experience. A private dining room is lined with rows of wine bottles, some of which Begaj says will have Albanian roots. The juxtaposition of modern and vintage elements carries into the service at Besa. For drinks, guests are encouraged to sift through a wide array of spirits, beer, and wines from an electronic tablet. However, the waitstaff is happy to give a good old-fashioned explanation of the beverage or meals you’re considering — and a story behind their origin if you wish. Besa, 600 Woodward Ave., Detroit; 313-315-3000. Mon.-Sat. L&D; Closed Sun.